I’ve spent a fair amount of time in the reviews of the first few episodes of this season of The 100 hailing the show’s decision to move ahead six years in time. From the season premiere onwards, it’s proven to be a smart choice, and the crux of my thinking has been that it’s allowed the characters time to change in necessary ways. Bellamy, removed from Earth and the place of his greatest sins, finds redemption and love. Murphy loses love, but continues to interrogate himself and his motivations in the hopes of being better to those around him. Clarke, once the leader of a massive tribe, had to survive on her own and then take care of a single person. Then there’s Octavia. My assumption has been that she’s been hardened in the bunker, and that would lead to conflicts down the line. “Exit Wounds” proves that Octavia has certainly changed in the six years she’s been in the bunker, but what I hadn’t considered was how the show would use that change to explore some truly heavy themes. Confrontations with Bellamy and Clarke are predictable, necessary storytelling steps. They show that this world isn’t the same as it used to be. There’s no point in jumping ahead six years if the characters swiftly return to their old dynamics. So while those interactions between the original 100 crew are predictable, there’s something much more intriguing going on when the show expands beyond that scope and explores the shifting nature of this world as a whole. In other words, I hadn’t anticipated the monumental effect a change in leadership would have on the show, and “Exit Wounds” is a perfect example of how the changes in character influence the thematic underpinnings of the show. This is maybe the weakest episode of the season, largely because it feels like a table-setting episode in a season that’s been defined by compelling forward momentum, but it’s still rich in thematic detail. While the plot itself is rather familiar and uninteresting—there’s a whole lot of running around and people plotting to stay ahead of their enemies, which we’ve seen plenty of already—“Exit Wounds” earns points for doing a remarkable job of depicting the chaos and uncertainty that follow any sort of challenge to the status quo. There’s hardly a more concrete challenge to the status quo than the burning of Earth and six years of isolation before people living in the woods, people living in space, and prisoners living on a mining ship removed from all information about what’s been happening on Earth suddenly come together. The first few episodes make it clear that the initial coming together of these groups is defined by suspicion and impending violence. Everyone is trying to make deals for their people, but there’s no trust between leaders. That means that nothing gets done, and all that’s left is a violent struggle for land, power, and influence. “Exit Wounds” is the beginning of that struggle, and it’s compelling in the way it explores the psychology of living in a world that has no leadership, no set of defined rules, and a shifting understanding of what’s right and wrong based on survival rather than shared humanity. It’s not a stretch to suggest that, while we don’t have Praimfaya, our own world is undergoing its own shift. Culture wars and partisan politics have us yelling and screaming at each other, seeing enemies at every turn, and that’s reflected in this episode. 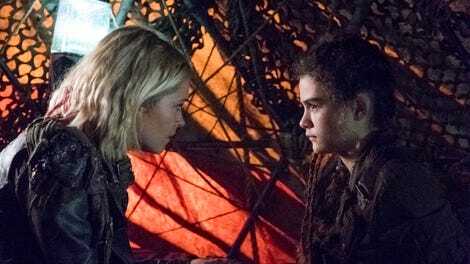 This season of The 100 is taking its time to build a world that feels eerily familiar, and “Exit Wounds” is the most obvious example yet. It’s an episode chock-full of leaders vying for power, people unsure of where to go, and a select few trying to sort it all out and determine what’s best for everybody. There’s an absence of truth in this world, no guiding force that everyone can rally around. There’s only divisions, violence, and further alienation. Octavia sees no way forward for Wonkru that doesn’t involve eliminating the Eligius crew on the ground, while Bellamy is convinced that will only lead to more bloodshed and more problems within Wonkru. Even Clarke, who’s always finding ways out of tight jams, can only choose to run when Niylah discovers that Maddie is a pure Nightblood, and therefore a threat to Octavia’s rule. By the end of the episode, Maddie has revealed herself to Octavia, and insists that she’s safe now. But so much has changed in the last six years—“that’s not my sister,” says Bellamy in a truly heartbreaking moment—and that means that safety is illusory. Everything in the post-Praimfaya world is up for grabs, and “Exit Wounds” is the beginning of the power struggle. It’s an episode that doesn’t advance the plot a ton, but it does serve to underscore the brutality of this world. Everyone, from Echo to Bellamy to the original Shallow Valley Crew, are trying to figure out where they fit in. That means allegiances and loyalties will be tested, which all but assures more blood and more bodies before this season reaches it end. This is what happens when leaders fight for power. There’s a vacuum that feeds on anger and fear. Maddie goes to Octavia because she’s consumed with the myth of the warrior, not because she knows her. The Eligius prisoners continue following Diyoza because they know no other way. There’s no truth, and nothing substantial to latch on to, so everybody is grasping at flawed idols and exclusionary plans. This is a world on the brink of massive conflict. Bellamy and Echo, Murphy and Emori. This is the ultimate sexual tension episode. Speaking of which, when the characters start to, you know, get it on with each other, does anybody else think about how they probably haven’t showered in months/years? 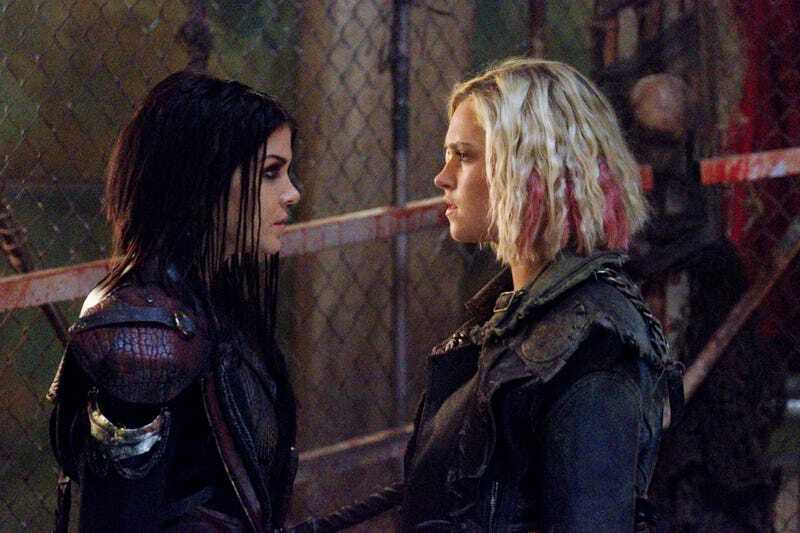 Bellamy: “You killed your own people.” Octavia: “I executed traitors.” That about sums up the disconnect. I love all the scenes with Murphy and Emori tonight. They litigate their breakup, and that gives us some necessary insight into their struggles. What Murphy doesn’t seem to understand, or that he understands and resents, is that Emori found herself in space. She fit in, she found a role, and was valued. That’s huge for her, and yet Murphy sees it as a threat.